So I was viciously attacked in guild tonight for not having ridden the DMF carousel, or rolling a DH/DK. Q4tQ: should I leave my guild now or suffer in quiet dignity? Sounds like you need to find some people who respect you to play with. Also, from a time efficiency standpoint, the carousel is a faster way to get your XP buff. Plus I think the fact that you can stay on it for as long as you’d like while keeping the buff at max is a nice perk. It is a little break in the middle of a leveling binge. Q4tQ: Do you care about the new Hearthstone Xpac release? Definitely, though I am currently suffering from a bout of post pack opening blues. I think this happens to everyone who just opened a pile of new expansion packs: no matter what you got, you didn’t get the right cards and your future decks are ruined before you have even started building them. If I didn’t care, I definitely wouldn’t feel like that, so… hmm… maybe it’s better not to care? Ha, who am I kidding! I’m going to figure out some way to make it work after I’m done being unhappy that I don’t have all the pieces I need to make a dragon Paladin deck. Q4tQ: Are Warriors good guys or bad guys in the new Hearthstone xpac? It’s all about perspective. Are Dr. Boom and his compatriots fighting for freedom against the oppressive rule of the magocracy? (And maybe, just maybe, pick up a few treasures for himself while he’s there.) Then they’re the good guys, fighting for freedom! Are Dr. Boom and his compatriots invading the free and peaceful city of Dalaran? Then they’re a mean crew of criminals. But maybe they’re something else all together. Maybe you’re a warrior disillusioned by Dr. Boom’s erratic, obsessive behavior and you want nothing at all to do with this. Perhaps you’re out to defeat him and defend Dalaran, or perhaps you just don’t care and you’re staying as far from Dalaran as possible. Hearthstone is an anything goes sort of game. Good, bad, we’re all praying to the same RNG gods in hopes of getting a good card draw. QftQ: If you could rewrite any WoW lore character’s canon story (if finished) which one and how would you do it? Wrathion, but not to rewrite him, exactly: I’d just like him to have done something over the last few expansions. That’s not too much to ask, is it? I’m not sure, but I hope it’s the Heart of Azeroth because I don’t speak Old God. If you think about the fact that WoW was originally developed based on the Warcraft III game engine, then it’s about TWENTY YEARS old; I know, i know, Blizzard has adjusted, reprogrammed and tweaked the hell out of it over the years, but damn, that’s a LONG time in tech terms. Heroes of the Storm is based on Starcraft II, easily ten years old. Overwatch is going on five years now (if you assume when they started developing it). Every week, it seems like I read some news about another game/MMO shifting to a new game engine. Unity and Unreal are constantly iterating new versions/features. Tech moves at a fast pace, and computers today can handle a LOT more stuff than their 2000 counterparts. Yet WoW, with its two-decade-old code, endures. But while I can run “modern” games like Anthem or Destiny smoothly, if I turn up WoW’s water FX or draw distance my laptop will start to melt. Rebooting 2 or 3 times a session is just “standard operating procedure” when i play. So where is WoW heading? With all the work being done to revive “vanilla” WoW, I have to assume that the devs (most of whom were not at Blizzard back in 2002) are asking fundamental questions about the tech behind the game. 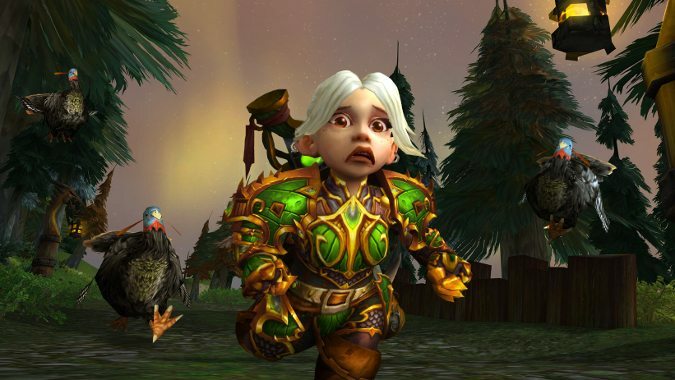 I know that “if it ain’t broke, don’t fix it” may apply here, and game engine development is nightmarishly complex and expensive, but is it time for a new WoW engine? Or would that so fundamentally change the game that it would kill off the franchise? I’m going to file this one under “if it ain’t broke, don’t fix it,” even though I’m aware that what you’re describing probably qualifies as “broke.” For my part, sometimes I have graphics set to 6 or 7 and get a super smooth 60fps. Sometimes I’ll have those graphic settings and get 10fps, under the same or similar conditions. Sometimes I’ll drop my graphics settings down to 2 or 3 because of poor performance and still get 10fps (or less). Reboots usually fix it. I actually suspect part of the problem is with the Battle.net launcher, which will sometimes get “stuck” running in the background even when it appears to be closed — I have mine set to automatically close when I launch a game because it is a computer-murdering app, but sometimes it lurks in the background, eating CPU cycles and destroying everything in its path. I just opened it and checked: Agent, which is part of the Battle.net app, is using up 98% of my CPU cycles. I just closed Battle.net but Agent is still there, still chewing through my CPU power until I can do nothing else. I have to force close the process or reboot to make it go away. Now that I’ve closed it, Chrome is my CPU hog at … 5%. Some of this code is definitely rough. It may be time, or even past time, for WoW to get a new engine instead of continuing to pile new code on top of old. But starting from scratch isn’t exactly easy. The dev time for a new game is measured in years, and I don’t think any of us want to pause our playtime for that long while we wait. That would mean a dedicated dev staff for a 2.0 engine, building it in parallel with the existing game. And while they do build it, they may still find themselves beholden to old code to maintain compatibility with existing game content — or they would have to update all of that, too. However you slice it, it’s a big job. And though it could amount to a huge quality of life improvement, what if it isn’t? Even a new game will have bugs (sometimes lots of bugs), and a brand new version of WoW could just swap old problems for new problems. Maybe Blizzard’s patches to the old engine are as good as it gets. Even if this isn’t as good as it gets, building a new engine from scratch would be a big job. I just don’t see it happening unless something really is really broken. And if it isn’t… well, we don’t need to fix it, do we? Damn Mitch. It’s time to change my loyalties to team Liz, huh? But gnomes are the worst. Mitch, don’t abandon me. I will get you knaifu back! Q4tLiz: what happens to this world if Mitch succeeds in consuming your essence? Will there still be dogs at least? … why is everyone conspiring against me today? Well, that’s enough of that. I’m off to build a wall around my house to ward off potential attacks. There will razor wire and a moat full of alligators to keep anyone who might do my harm at a safe distance. Bye for now!